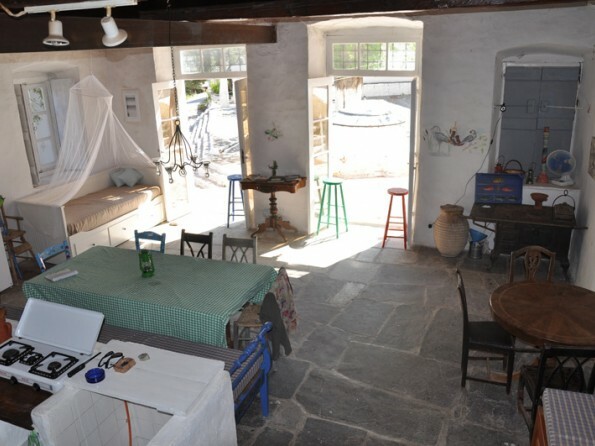 Spiti Cameron is a beautiful two bedroom Venetian stone house dating back to the 1800s on the idyllic island of Hydra in Greece. 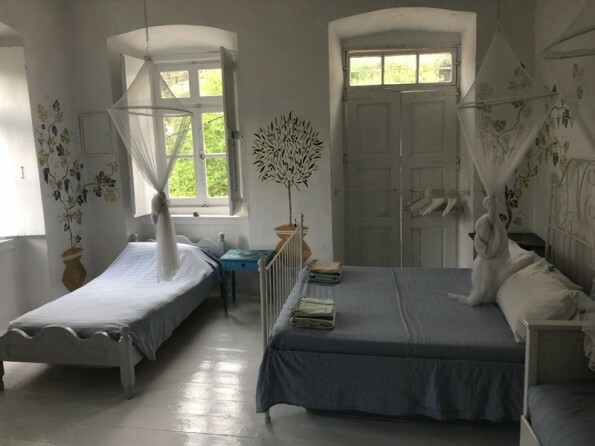 Set in the historical area of Kala Pigadi at the back of Hydra town, it’s a 15 minute walk from the port where you can while away the morning in one of the numerous waterfront cafes, or head to one of Hydra’s many wonderful beaches. Hydra is the gem of the Saronic Gulf islands and is the only of the Greek islands which doesn’t allow motorised vehicles - no cars or noisy scooters - just tiny cobbled lanes, donkeys, beaches and sea! 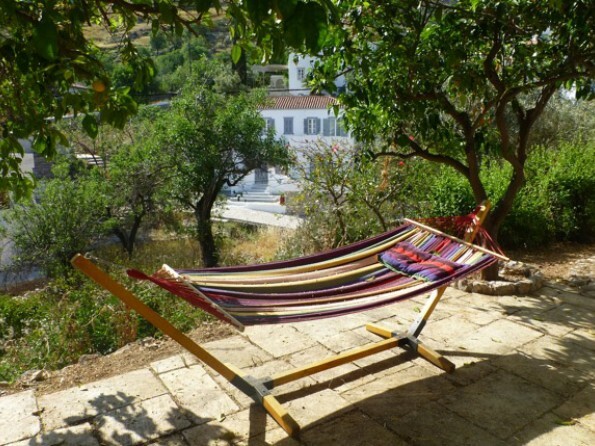 Artists, musicians, actors and celebrities have all been drawn to Hydra over the years, and with good reason - it’s an idyllic retreat with a wonderfully slow pace of life. There is beautifully preserved stone architecture, rural pathways, clear waters, and numerous wonderful spots at waterfront for a cappuccino and some serious people watching. Hydra has a bustling harbor full of shops, restaurants, and quayside cafes which are perfect for sipping a leisurely cappuccino and people-watching. 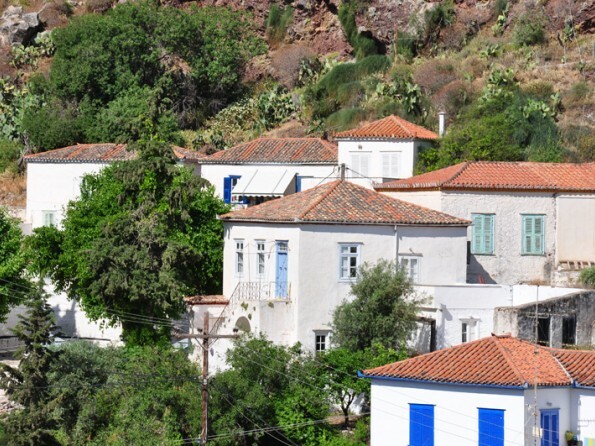 Tiny cobbled lanes and winding staircases crisscross the island's villages. Getting around is by foot, boat or donkey. There are boats on the harbour that act like a bus service or you can get a water taxi. These will take you to the beaches around the island or you can walk. 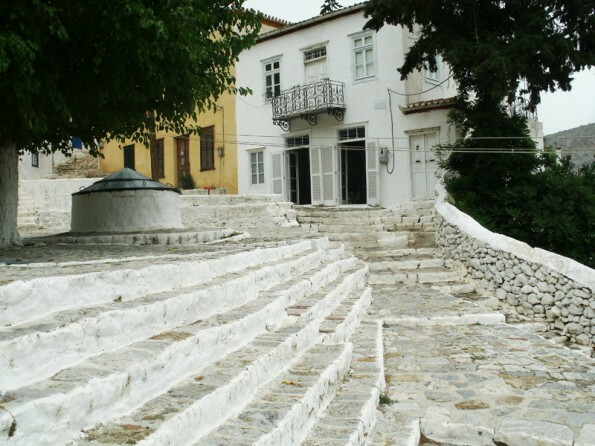 As well as getting to the beaches there are some beautiful walks to the monasteries and other areas of the island. 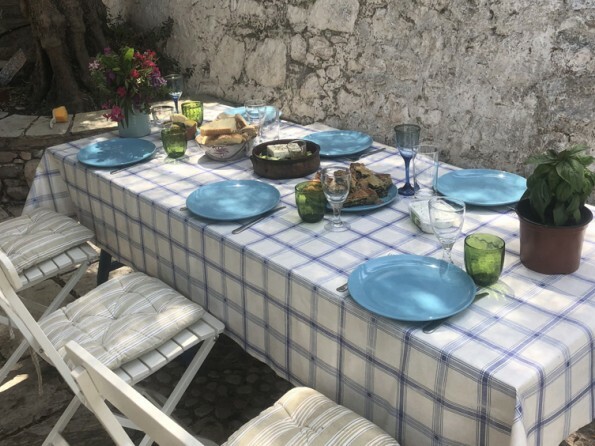 The house is set in a peaceful area at the back of Hydra town but within minutes you can be shopping or partying in the town, or swimming in one of the nearby azure coves. The whole island has been preserved as a national monument. 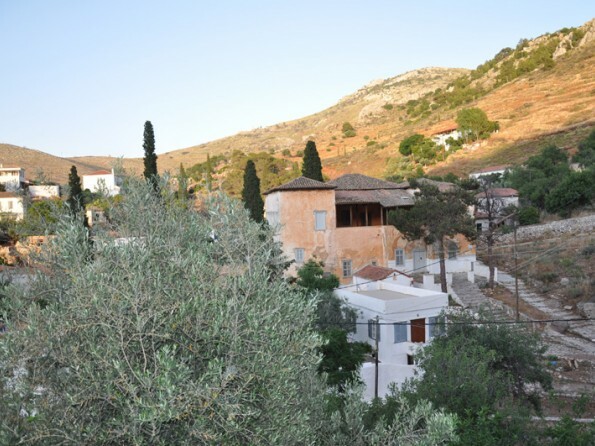 Nearby islands include Spetses and Poros, easily visited by day trip, and the pastoral Peloponnese with its wonderful ancient sites (Epidavros, Mycenae and Mystras) and quaint Venetian seaside town, Nafplio. The small island of Hydra lies in the Saronic Gulf, 61km southwest of Piraeus (Athens' main port) and 7km from the Peloponnese. There are no cars on the island. Visitors reach Hydra by ferry from Piraeus (90 minutes by hydrofoil, two hours by catamaran). Or, they can drive to Metohi on the Peloponnese (3 hours from Athens) and take a small taxi boat across to Hydra (15 minutes). Please enquire for details of an excellent taxi driver - it’s more expensive than a yellow cab but he speaks English and will confirm the price before. 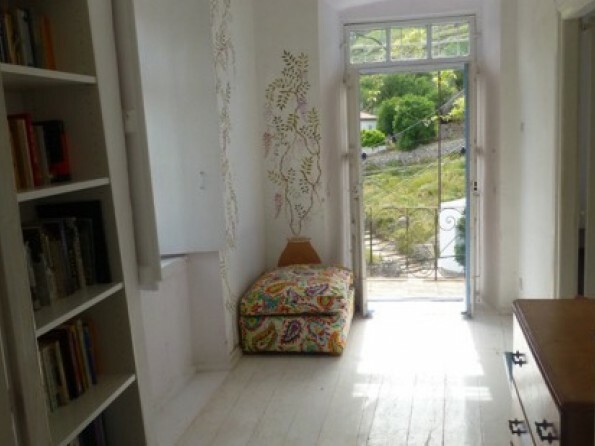 The house is basically but adequately furnished and offers simple island accommodation across two floors. You enter the living room directly from the street. This is a large space with a lofty ceiling, stone floors and thick walls which keep it refreshingly cool in the summer months. There is a good sized kitchen area at the back of the living room with a small oven, three gas rings, and a good sized fridge freezer. You’ll find plenty of crockery, cutlery, utensils etc. There is also a washing machine. 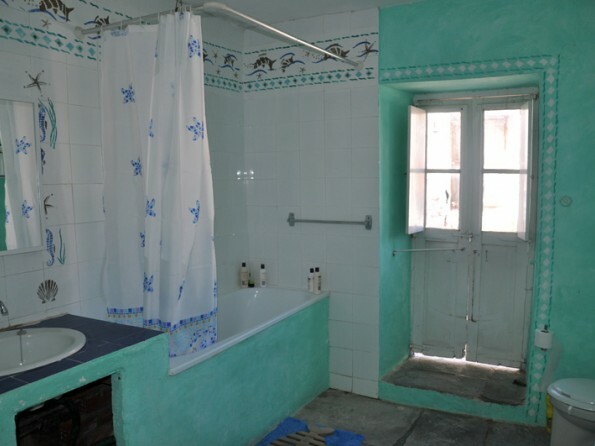 Off the back of the living room is a bathroom with WC, hand-basin, full sized bath and shower unit. 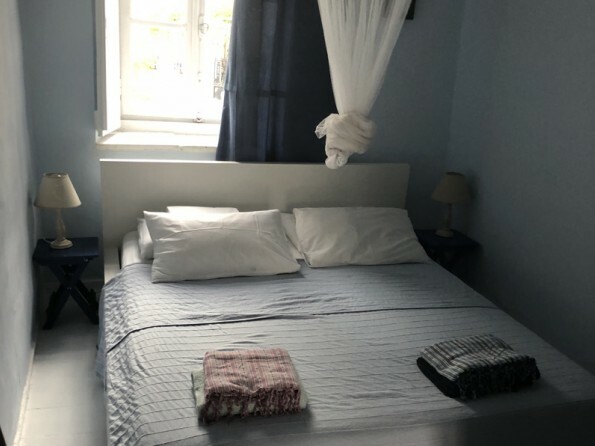 Stairs lead up to the first floor where there are two bedrooms; one double and one with a double bed, two single beds and a daybed which can pull out into a double. Both bedrooms have lovely views, plenty of cupboards and drawers, and fans for when the nights feel hot. Access to the garden and terrace is from the ground floor (kitchen end). There is a large split level terrace with table, chairs, a hammock and a BBQ. The rambling garden is full of fruit trees which you are welcome to enjoy when in season. There is also a good sized roof terrace from the first floor landing which is very private and not overlooked so an ideal place for sunbathing. There are external stairs accessible from the first floor landing leading down into the garden. The house is at the top of a steep hill. It is possible to get a donkey up if you wish. We would recommend that you hire a donkey on your arrival to carry your luggage up and perhaps some provisions from the shops. 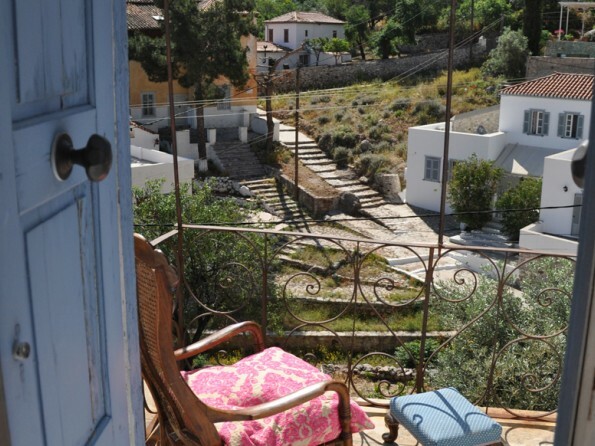 The house is about a 15 minute walk along a level wide road from the centre of Hydra port. 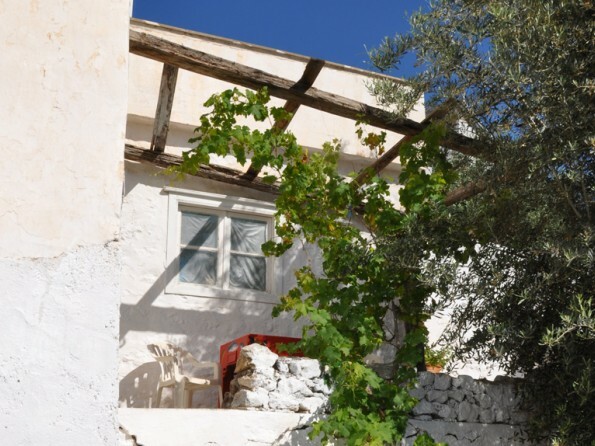 The house is rented on a minimum of 7 nights for a maximum of 4 people basis. We require a 50% deposit to secure your booking with the balance due 8 weeks prior to arrival. Please note that the staircase is open at the sides. There is a travel cot available at the house (please bring your own cot bedding). There is no wifi at the house however you can sometimes get 3G. There are many wild cats on the island - please don’t encourage them into the house. There is hot and cold running water in the house, and a well with delicious drinking water right outside your door.